Slumping like a stack of laundry, in mirrored darkness. The satin soft of the children and youth mellowed in. The twinkles of eyes, the faces of merriment. The winding stairs, squeezing in sunshine, and rain. Memories slide back and forth like wayward mercury. 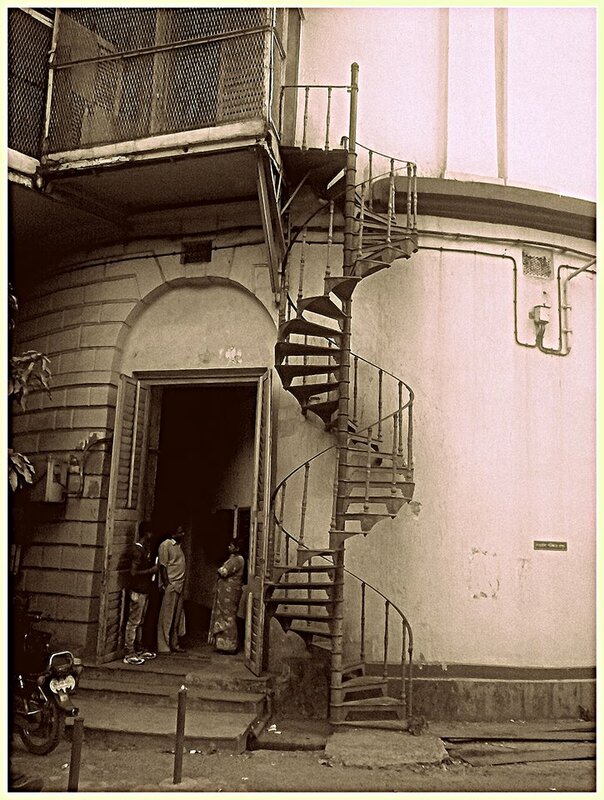 Memories are the chapped feet on the spiral staircase. Shutters clanged against the windows, the balcony of old clothes. Revamp it, in opportune time. Pining for love, and nourishment. ‘Born into Brothels’ happens to be the first documentary that I had seen together with my husband, a documentary movie buff. 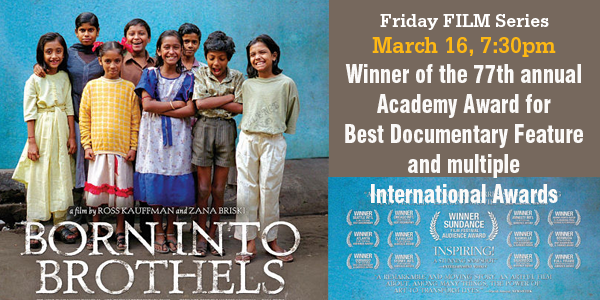 I remember how deeply moved and emotional I had been while watching filmmaker Zana Brisky’s exceptional journey into the forsaken alleys of Kolkata’s red light area, and her discovery of the children born into those brothels. Today, after I had watched the film again, those emotions rushed back to me, and I instantly reconnected with those mighty moments of exploration, depicted with so much of honesty and ingenuity. This essay is a personal journey of remembering and honoring the film, eight years after I had first seen it. 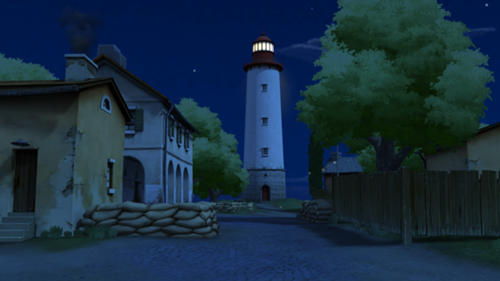 The review was initially published at Associatedcontent.com, and later, was republished at ‘Yahoo Voices’. In a world of abject poverty, abuse and despair; the resilience of childhood and the restorative power of art go hand-in-hand to transport children born in filth to a new world, a world which they are taught to discover with new eyes. Those who have seen the seething documentary written and directed by Zana Brisky and Ross Kauffman named “Born Into Brothels” based in the red light districts of Calcutta, will surely be able to identify this image as a central element of the much acclaimed film of 2004. Looking back at this immensely inspiring and uplifting documentary that puts other narrative documentaries to shame even after 3 years of it’s release, it is amazing to discover that even today, many of us still want to talk about the film, about the several unforgettable children born in the red light area portrayed so sensitively in the film, and also want to analyze the filmmakers’ vision in making the film. The principal reason behind this eagerness is not merely the fact that this widely acclaimed documentary had won the Sundance Film Festival Audience Award and the Academy Award back in 2005, but the intensity and honesty with which the filmmakers Zana Briski and Ross Kauffman chronicle the amazing transformation of the children they come to know in the red light district. Precisely, this was something which had not been commonly touched upon by filmmakers. Take a close look at the theme of the film and you will easily see that the filmmakers actually wanted to tear the façade of the apparently growing prosperity of India and unravel the dark underbelly of poverty, depravation and human exploitation that keeps growing in the other side of the nation. In cinematic terms, there is a debate as to why after an absolutely engrossing first reel, the directors follow a slightly frustrating route, with the focus shifting to a more conventional individual vs. the system story. But one has to understand that the film comes out of an impulse of the filmmakers not only to document the lives of poor, neglected and oppressed, but also to chronicle the world of resistance and chaotic bureaucracy that surrounds it. Seen from this perspective, it can be said that the film tempers its optimism with realism in a way that is both uplifting and heartbreaking. There is a surrealistic delight in the pluck and intelligence that blossom in middle childhood. At the same time, there is the cruelty of social arrangements that allow those qualities to be squandered, which justifies the second half of the film. The debate which ensued as an aftermath of “Born Into Brothels”, was on whether the documentary has truly improved the lives of the children featured in it. While the film-makers claim that the lives of children appearing in “Born into Brothels” have been transformed by money earned through the sale of photos and a book on them, some volunteers and organizations disputed the claim that the children’s lives have been improved, arguing that Briski should be criticized for using hidden cameras, misrepresenting the children’s parents and ignoring the prostitutes’ substantial efforts to unite. As a filmmaker, Briski knew that the circumstances of these children were too complex to be revolutionized by educating one family member in photography, or even by sending them to boarding school. For the records, the film itself depicted scenes in the end where many of those put into boarding school ended up leaving the school and returning to their previous life of squalor before long. Coupled with it, there was the challenge to counter hundreds of years of narrow mindedness and the proverbial Indian bureaucracy. As a filmmaker, Brisky deals with all this not as a social worker, but as a sensitive human being with her own vulnerabilities. This is precisely what brings a sense of truth into the entire exercise of creating the film, for which the film deserves a special mention in the world of narrative documentary film-making. Note for the readers: This is a poem I had written nearly 14 years back, with a young, unrestrained mind. Fresh from the University, my head was brimming with poetic lines, and the emotions were delicate, honest, but raw, unbridled and devoid of precision. I remember I had put a lot of long elipses, periods and also long hyphens in between the lines, and looking at them now, I thought them awkward and odd. With a little bit of editing, this is what the poem looks like in its present state. Clutching at each other in sensuous extremity. The other hisses, ”In keen memory, we have stored our silences like mistresses! We adore them in shady depths of secrecy. Flesh and bone struggling with myths of light. In the “living” without “life”! None can see, nor hear at all. Never explored by spoken truths, or spoken impostures. To the fleshless depths of solitude. Now, let us plunge into thee. Women of color are everywhere today. Be it the stupendous creative world of poetry or provocative fiction and nonfiction literature that is breaking the boundaries, be it the world of innovative filmmaking in respect of world cinema, they have been there, done that, and conquered hearts. Looking into the history of world cinema, it is imperative that we take into account the immense contribution of talented women filmmakers of Africa and the African Diaspora who have made a mark with their innovative filmmaking. Not only are they challenging old cinematic prescriptions, they are also using their superior art of cinema to create and establish new visions of their people and the world. The journey of black women filmmakers began as early as 1922 when Tressie Saunders, a black woman director made the exemplary film ‘A Woman’s Error’. 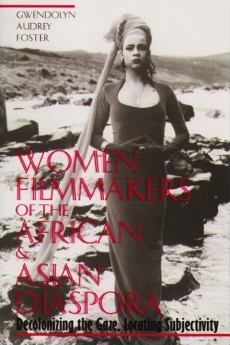 It was the first attempt of its kind in that era to “decolonize the gaze and to ground the film in the black female subjectivity”, as the author Gwendolyn Audrey Foster has pointed out in her book ‘WOMEN FILMMAKERS OF THE AFRICAN AND ASIAN DIASPORA: DECOLONIZING THE GAZE, LOCATING SUBJECTIVITY’. However, today even after a long history of evocative work, black women directors have had a long, slow path to the director’s chair, where only a handful of black woman filmmakers have been able to break through the racial barriers in Hollywood. However, let’s not talk about Hollywood here, but look into how these women have been received in respect of world cinema. In fact, filmmaker Julie Dash (originally from New York City) had long ago won the Best Cinematography Award with her much acclaimed film “Daughters of the Dust” at the 1991 Sundance Film Festival. On the other hand, Cheryl Denye from Liberia had received worldwide fame and accolade with her film The ‘Watermelon Woman’ (1996), which happened to be the first African American lesbian feature film in the history of world cinema. Another Black woman Safi Faye has to her credit several ethnographic films that brought her international acclaim and earned her several awards at the Berlin International Film Festivals in 1976 and 1979. Besides, there are independent black women filmmakers like Salem Mekuria producing documentary films focusing on native women from Ethiopia and on African American women in general. In 1989, Euzhan Palcy became the first black woman to direct a mainstream Hollywood film, ‘A Dry White Season’. In spite of all this success, it is still true that the state of things isn’t all that rosy for African American women filmmakers. A documentary named “Sisters in Cinema’ by Yvonne Welbon has tried to explore why and how the history of black women behind the camera has been made strangely obscure in all of Hollywood. “Sisters in Cinema’ happens to be the first and a one-of-its-kind documentary in the history of world cinema that attempts to explore the lives and films of inspirational black women filmmakers. In fact, the 62-min documentary by Yvonne Welbon, “Sisters in Cinema” came up in 2003 to commemorate the success and the colossal achievement of black women filmmakers throughout the ages. The film attempted to trace the careers of inspiring African American women filmmakers from the early part of the 20th century till today. As the first documentary of its kind, ‘Sisters in Cinema’ has been regarded by critics as a strong visual history of the contributions of African American women to the film industry. “Sisters in Cinema”, they say, has been a seminal work that pays homage to African American women who made history against all racial, social barriers and odds. While being interviewed, the filmmaker Yvonne Welbon admitted that when she set out to make this documentary, she had barely knew there were any black women filmmakers apart from the African-American director Julie Dash. However, in pursuit of seeking those inspirational directors, she set out to explore the fringes of Hollywood where she discovered a phenomenal film directed by an African American woman Darnell Martin. Apart from that film ‘I Like It Like That’, she discovered only a handful of films being produced and distributed by African Americans. Thus saying, the monopoly ofHollywood by white filmmakers, producers and distributors inspired her in a way to travel the path of independent filmmaking. Surprisingly, here she uncovers a wide range of really remarkable films directed by an African American woman outside of the Hollywood studio system and thus she found out her sisters in cinema. Within the 62-hour documentary, the careers, lives and films of inspirational women filmmakers, like Euzhan Palcy, Julie Dash, Darnell Martin, Dianne Houston, Neema Barnette, Cheryl Dunye, Kasi Lemmons and Maya Angelou are showcased, along with rare, in-depth interviews interwoven with film clips, rare archival footage and photographs and production video of the filmmakers at work. Together these images give voice to African American women directors and serve to illuminate a history of the phenomenal success of black women filmmakers in world cinema that has remained hidden for too long. A few years back,in October 2005, there has been the ‘Eighth Annual African American Women In Cinema Film Festival’ in New York City. It was another remarkable event that showcased exceptional feature and documentary films as well as short films made by African American women filmmakers like Aurora Sarabia, a fourth generation Chicana (Mexican-American) from Stockton, CA, Vera J. Brooks, a Chicago-based producer, Teri Burnette, a socialistic filmmaker, Stephannia F. Cleaton, an award-winning New York City newspaper journalist and the business editor at the Staten Island Advance, Adetoro Makinde, a first generation Nigerian-American director, screenwriter, producer, actress, among others. Also, from February 5 to March 5, 2007, there has been the celebration of the Black History Month by the Film Society of Lincoln Center & Separate Cinema Archive, in which the center presented “Black Women Behind the Lens”. A seething documentary, “Black Women Behind the Lens” celebrates the uncompromising cinematic labors of love created by a group of brave African-American women. Gifted with rare determination and undaunted spirits, these black women filmmakers were committed to speaking truth to power while offering alternatives to the stereotypical images of black women found in mainstream media. They resorted to Guerilla filmmaking, an artistic rebellion in the face of the long established network of Hollywood and have challenged old cinematic perceptions, using their art to erect new visions of their people, their heritage and their world. Noted theoreticians, sociologists, women writers, directors are saying that it is good to know that women filmmakers of Africa and the African Diaspora are challenging old cinematic prescriptions and creating their own visions in the cinema they love to make. However, while a significant number of women in Africa and here in the have been able to carve out successful careers in filmmaking, the hurdles are particularly daunting. The problem, says Elizabeth Hadley, the chair of Women Studies at Hamilton College in Clinton, N.Y., is not particularly about black women making films, but the issues of marketing, distribution and funding. As a result, the majority of these women are finding money independently and working on shoestring budgets. However, all said and done, it is enough encouraging to know that at least some of these women are daring to decolonize the gaze of Hollywood and to ground their films in black female subjectivity. Any attention or recognition that comes when these women desire to communicate their ideas about black people’s history, heritage, with an emphasis on women’s experience, must be welcome! P.S. This article was originally published at Yahoo Voices, titled ‘Black Women in Filmmaking: The History and Success of Black Women Filmmakers of Africa and the African Diaspora’. The numb darkness in the midnight room beckons. That travel the world of the living. The night gallops by, hour after hour, a runaway horse. In its lullabies, sing of indescribable wounds. The wind carries her voice away..
Up there in the sky, with flames gorging the darkness of the night. Or an illusion of ME, surrounding the calm.. I am waiting, as usual, at the edge of sleep.. Unshaken by the somber wind. In the eager darkness of return! To all my writer friends all over the world, what does writing mean to you in your life’s journey? Is it intrinsic to your life’s journey? Is it a stranger? Is it a friend? Is it a barging intruder? Was the sheer act of writing a conscious choice for you, or did it come to you by serendipity? As for me, this personal essay sums up my writing journey, and the relentless struggles I had and am still having with the pursuit. It has won an honorable mention at a writing contest hosted by Writerscafe.org titled ‘Why Do You Love Writing’. In silent moments with myself, all these years, I have asked myself a thousand times: “Why do I have to write?” Or, let’s put it in this way: “why do I think I want to write” or “what do I think writing means to me?” In this big, bright, solemn computer-lab, where nameless, faceless entities come up with grim faces in front of desktop screens and type papers for hours, I am faced again with my usual confused, vulnerable self and ask: “why is that I sit here and write about why I want to write”? What is there in the sheer act of writing that has made me what I am, what I believe in today, or what I would want to do if I need to have a life of my own beyond the confines of our home, my family? I had asked myself why I needed to write in my seventh grade when I had learned to muster courage enough to write my first poem about changing seasons for my school magazine, where I had rhymed each line with care to show my friends and my English teacher how I could implement the idea of a verse. I had asked myself why crafting those lines and thinking of crafting others, secretly, at the back pages of my science homework copy had become a ritual of salvation for me, as I had loitered around the huge hallways of my school building, playing in my mind with words and rhythm when the cuckoos chirped mindlessly in the dusty windows of the classrooms when all my other friends were busy solving their sums, preparing notes for their biology classes, or were just chit-chatting. I look back at those days and think why that secret, silent kingdom of unspoken words and rhythm was all that cherished for me when the sudden bursts of rain used to drag me to the drenched grass and muddy patches of our school compound, when the constant tinkling bell of the rickshaw-puller and the cart of the ice-cream seller passing by the school premises carried within them promises of sweet nothings, transporting me to a world of delight, cadence and artistry in the visible world. As the days passed by, I have asked myself why this journey of mine with the written word has bound me up, tighter and tighter in chains, as my daily struggles in pursuits other than writing have increased with each passing day, as I have continued to be an engrossed listener of those unspoken words. I still do not know the answer. I only know that by the end of high school, as I went on exhibiting my incompetency in numbers and computations, scientific arguments and logic, I went on earning the highest grades in English, writing the best essays and composition papers in the class, which in turn left me with no other avenue to step into for college education other than English. Back at home, when it has been a constant struggle trying to fit into paradigms, and constantly failing at it, I had never known why or how the Almighty had drawn the lines of my destiny in different patterns. Today, late at night, my husband works with rapt attention with SQL server, with the oracle database administration of his company, a giant business conglomerate. I, his unemployed, student wife, read Lady Chatterley’s Lover at the other end of the same desk, trying to flirt with the written words as they trickle down my spine with their divine nectar, breaking down upon me with some euphoric hunger. It was probably the same hunger that started to tear me apart when in my college days, I first encountered Romantic English Poetry and wanted to write, like Lord Byron, “She walks in beauty, like the night /Of cloudless climes and starry skies;/And all that’s best of dark and bright /Meet in her aspect and her eyes”….At the end of each act of scribbling, I got to know that my crappy love poems would never see the light of the day, and that in order to write some sane, sensible stuff, I need to study something more meaningful, like journalism. I still think fervently of the days when in my reporting and writing classes in Mass Communication, the teacher recognized my thoroughly poetic and artistic narrative voice and constantly mentored me to tone it down to the every man’s crisp, prosaic voice, like it is there in the daily newspapers. I remember the unrestrained expression of delight and discovery as I look back to my first freelance assignment in a newspaper in Calcutta where I had written about the juvenile prisoners in an asylum in the city, a news item where I remember my fights, my silent tears and excruciating struggles to trade my first by-line with a meager hundred rupees Indian note. I remember the passion and anticipation of my very young, working days when I slogged like a dog to write mindless business copies, one after the other, for corporate clients that demanded me to write precise and user-friendly paragraphs and punch-lines. I have witnessed almost all of it, the unsung glory of a writer in a business setting, the doubtful eyes of friends and relatives who did never quite understand why I kept changing workplaces for more creative freedom, who still do not understand, or, now that I am married and have kids, do not bother what I do for a living. I remember the silent tears of disbelief and dismay when I had been rejected as worthless and utterly incapable of being part of an editorial team in a publishing house that used to be my dream one day. I am still a hopeless romantic, now trudging the lone road of writing Creative Nonfiction as a Graduate Student. I think of the small presses and the couple of regional publications which have accepted my work, but molded it according to their own whims even without asking for my permission. I keep thinking of the constant rejection letters I have received from a number of publications here in the United States which, by now, should have solidified my cousin brother’s faith that I am utterly incapable of being there in the business of writing. But desperate and despondent lovers do get their way in the end in at least some love stories I have known. I still woo the act of writing, the one and only love of my life and will continue to woo the pleasures of writing with this solitary hope, and like the desperate lovers, this hope gives me salvation and ecstasy when I think of it at the end of the day.